Absolutely gorgeous work! Highly recommend and I will definitely be looking to purchase more work of this artists! 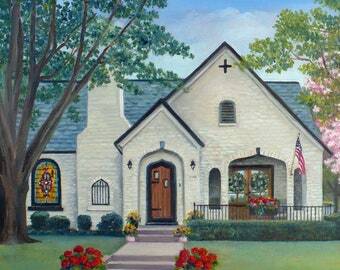 Janet did an outstanding job working with me on this custom painting. She was always very responsive to my numerous messages on the details and the painting she created was absolutely perfect. Painting an oil landscape of autumn trees that are just down the road from my studio. The ocean is a favorite retreat and is only a short drive away. 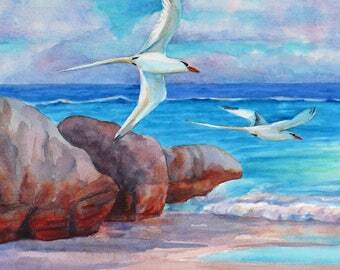 Here I'm creating a beach scene in watercolor. 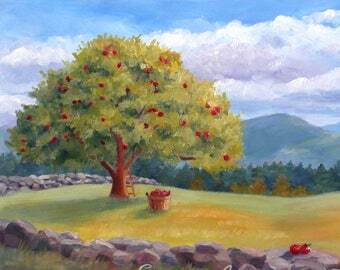 I enjoy painting outdoors, en plein air. 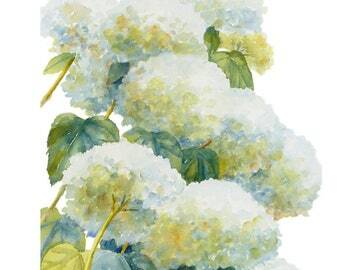 The hydrangeas blooming in my garden have inspired many floral paintings. 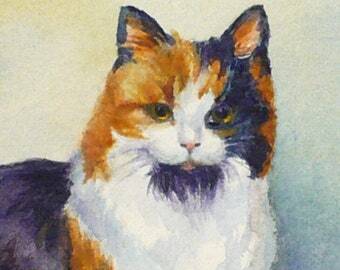 In my studio working on a pet portrait in oils of a calico cat. The rural countryside keeps me inspired! My day begins outdoors with work in the flower and vegetable gardens and tending the chickens. My day ends much the same way! In between I paint. As an artist, I am fortunate to live where my inspiration abounds. The farmlands, forests, wildlife, ocean and waterways of rural eastern Connecticut speak to me of the beauty of creation. Painting the loveliness is my response. Creating a painting can begin with something small that catches my eye - dappled sunlight on a flower, the fluttering wings of a butterfly, a bird that lands on my porch rail. Or it can be bigger - a composition of mountains, a torrent of waves or the blazing trees of Autumn. I snap a picture, do a quick sketch or make a mental note in my head to save it for later. When my inspirations develop into a painting and touch someone on an emotional level, it is greatly rewarding - especially when my art goes to a new home where it will be cherished! 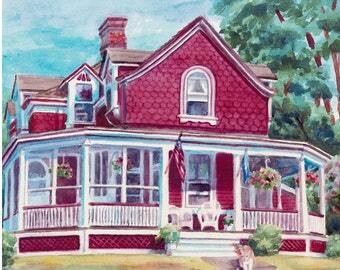 It is equally rewarding to create custom paintings of people, animals and special places. 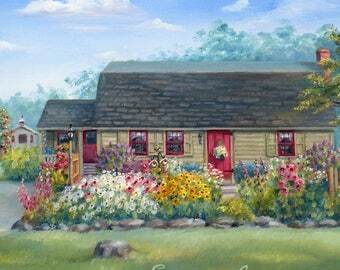 These personalized paintings provide my collectors with a lifetime of warm memories. To ensure these treasured art pieces retain their true colors, the materials I use to create my original art are designed to last. Professional grade paints, acid-free paper, canvas and mat board keep my original paintings looking fresh and new for generations to come. For my prints I use a professional lab whose methods and materials I have approved as being outstanding for color match, durability and archival quality. The colors in my fine art prints will stay rich and bright for a lifetime. People often want to know when I first began making art. Well, it was very early - as soon as I could hold a crayon in my chubby little fist! Since then, I have sold over a thousand original paintings worldwide, created murals and theater backdrops for the public sector and illustrated half a dozen books for local environmental agencies. Through all the years and all the artwork, the joy of creating and sharing the loveliness never fades. *If you would like a custom piece painted or you have a question, please contact me. I respond within 24 hours. If you don't see a response, check your email spam folder or come back to Etsy.com, sign in and check Conversations in the drop down menu under your profile picture. 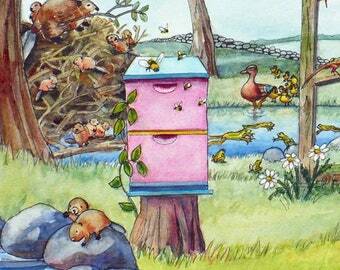 Hi I'm Janet, the designer and creator of the artwork in my shop. I enjoy hearing from customers and personally answering your questions. In my time off, I like to take walks in the countryside or at the beach, sing with a choir and dance ballet. For my customers ordering from Australia, prints are shipped from my fine art print lab in Brisbane, Australia. The prints are the same high quality as all my prints and are shipped within 3-4 business days. My prints are made by a family owned and operated business which produces high quality fine art prints for artists. Professional archival inks on Somerset Velvet watercolor paper keep the colors bright and fresh for decades! To save time and customs fees for my UK and European customers, orders from these countries are shipped from my fine art print lab in the UK. The prints are of the highest quality and are shipped within 3-4 business days. Thank you for stopping by my shop. I hope you will find a piece of artwork that will delight you! In order for your your art purchase to stay fresh and new for many generations, I use acid-free materials and professional permanent colors in my originals. Prints are made at a professional lab using the highest quality archival inks and papers. You can be confident that your investment will bring you a lifetime of beauty for your home or office. If you have a question, please contact me. I respond within 24 hours. If you don't see a response, check your email spam folder or sign in to Etsy and check Conversations in the drop down menu under your profile picture. RETURNS: Please contact me within 7 days for a prepaid return label. Items must be returned within 14 days of receipt and in the same new condition as shipped for a refund. CUSTOM ORDERS: Above all else, I want you to be happy with your custom artwork. You will receive an image of the completed painting to approve before shipment. I will be happy to make reasonable modifications if necessary - your satisfaction is important to me. CANCELLATIONS: To cancel an order, please request the cancellation within 6 hours of placing it to be sure you receive a full refund. If your order has shipped, it cannot be cancelled. Fine art print cancellations requested after 6 hours may incur up to a 45% "restocking" fee if my print lab has made the print. Prints are made to order and shipped directly from my lab to ensure that your artwork is brand new. 2. PAYPAL: Pay with your PayPal account, credit or debit card through PayPal. e-checks can also be used, but they can take 5-7 days to clear. 3. OTHER: This option may be used if you wish to make a 50% deposit on a custom order. When checking out using Other, your card is not charged. Instead, I will send you an invoice from PayPal which allows partial payments. Your order will be entered on my schedule after deposit payment is made. - Non-custom in-stock original paintings are shipped within one business day of receiving your cleared payment. 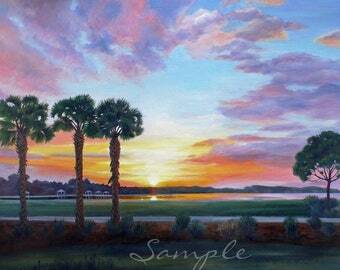 - Made to order paintings are shipped in 7 business days. - Prints are shipped within 3 business days for US, Canada, UK, EU and Australia orders. All other international print orders are shipped in 7 business days. 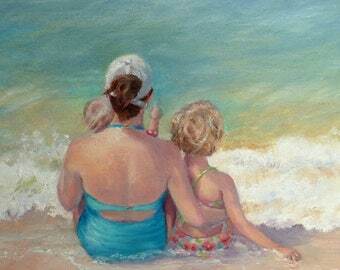 - Custom paintings shipping time frame varies - please ask and I'll give you an estimate. PACKAGING: Prints and originals are packaged securely to keep them safe during shipment. INSURANCE: Shipping Insurance is included for no extra charge. Please keep the original packaging and contact me right away in the case of a shipping mishap. You will need to send detailed photos for the insurance claim. INTERNATIONAL: For orders outside the U.S., allow extra time for the item to go through customs inspection. VAT or customs duties are not included in shipping charges. Please contact your customs office for fees as you may need to pay them upon delivery. - Original paintings are shipped from my studio in the USA and may be subject to fees. - Large canvas: a 24x36 inch and larger canvas may need to be shipped to international locations with the canvas rolled. A local frame shop can stretch the canvas for you. If you want it shipped stretched and ready to hang, let me know your location and I will get a shipping quote for you. - Prints ordered from the UK, EU or Australia are shipped directly from my print labs either in the UK or Australia to expedite the shipment and eliminate import fees. - UK Customers: Please be advised that original art purchases shipped from my studio in the US may be charged a 5% VAT by your customs office. There may also be an £8 handling fee from Royal Mail. There is no import duty for artwork. For custom paintings, make sure you own the rights to photos or other images that will be used as reference to create a painting. For example, if you took the photos yourself or a family member or friend took the photos and gives you permission to use them or you know they would give you permission, you are good to go. If the photos are old enough to be in the public domain, which is 70 years after the photographer was deceased, those images are also fine to use. However, if an event photographer or other professional photographer took the photos, please get permission in writing or email before commissioning the work. This keeps us all on the right side of copyright law. Thank you! To fulfill your order, you must provide me with certain information (which you authorised Etsy to provide to me), such as your name, email address, postal address and the details of the product that you’re ordering. You may also choose to provide me with additional personal information (for a custom order, for example), if you contact me directly. I do not collect or have access to your financial information which is handled exclusively between you and either Etsy's secure payment processor or PayPal. For purposes of EU data protection law, I, Janet Zeh, am the data controller of your personal information. If you have any questions or concerns, you may contact me at: info [!at] zehoriginalart.com or by using the Contact link on Etsy. 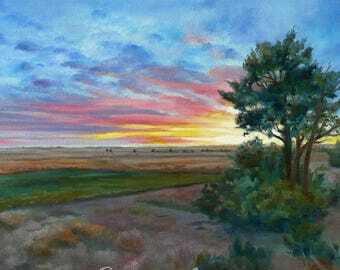 What is the difference between a watercolor and an oil painting? 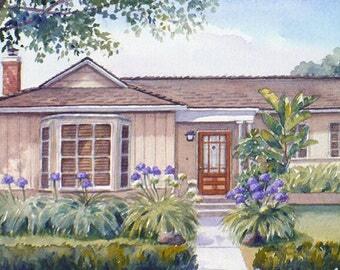 *A WATERCOLOR is painted on heavyweight paper with transparent watercolor paints which gives it a fresh, crisp look. Because it is painted on paper, you will need to protect it with a mat and frame with glass front. 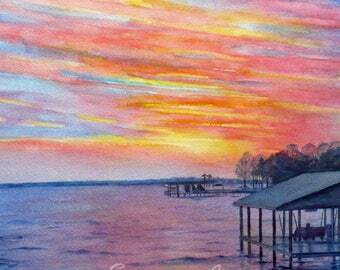 Framing finishes a watercolor beautifully and makes the entire art piece larger. 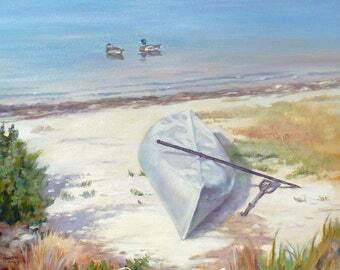 *An OIL PAINTING is painted on canvas with oil based paints. It has texture and a rich look. 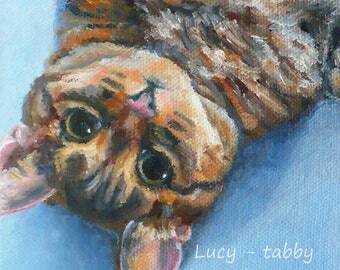 I paint the side edges of the canvas so you don't need to frame it unless you wish to. I ship oil on canvas paintings in special boxes to protect them. Since oils take 1-2 weeks to dry, keep your freshly painted custom oil in the box for a week or two until completely dry to the touch. At that time, you may hang it with the enclosed wire. How long will a painting or print keep its color? To keep the colors bright, I use acid-free materials and professional permanent colors for my original paintings. Prints are made at a professional lab using the highest quality archival inks and papers. This means that the prints will not discolor over time. Original paintings will last for generations! You can be confident that your art piece will bring you a lifetime of satisfaction. How do I take care of my painting? *WATERCOLOR paintings and PRINTS on paper will stay looking their best when enclosed in an acid-free mat and backing and then framed with a glass front. Keep artwork out of direct sunlight. 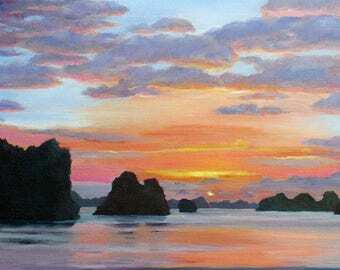 *OIL paintings with painted edges do not require a frame. If framed, no glass is needed. They may be varnished with spray varnish made for oil paintings found at arts and crafts stores. Varnishing is optional, but it adds a layer of protection to keep the painting clean and bright. **For new oil paintings, wait at least 6 months for the oils to fully cure before varnishing. However, the painting may be hung and/or framed as soon as it is dry to the touch. Oil paintings may be cleaned with a soft cloth which is slightly dampened with water if necessary. I ship original paintings from my studio in Connecticut, USA. There may be additional customs or tax fees due for international shipments when the item arrives to you. Print orders from the USA and Canada are shipped from my print lab in New York. Print orders from the EU, UK, Australia and other countries are shipped from my print labs in the UK or Australia depending upon your location. 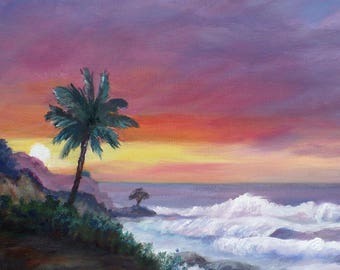 How can I order a custom painting? Contact me with your ideas and the approximate size you would like. I will give you a price and time frame for completion. A 50% deposit or full payment (your choice) is required before work is begun. In certain cases, a sketch will be made for you to approve before I begin the painting. 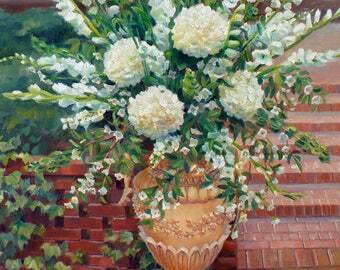 Upon completion of the painting, I will send you an image before final payment. At either time, you may request changes if needed. I want you to be happy with your painting! How do I make a 50% deposit on a custom painting? In the listing choose the size option, if applicable, and click Add to Cart. In the cart, select the OTHER option and check out. OTHER is below the PayPal option. *IMPORTANT: Make sure you use the Add to Cart button, not Buy Now. The Buy Now button will not show the Other option. If you still don't see it, you may have to move items in your cart that are from other sellers into Save for Later. The Other method will not charge your card but will initiate your transaction on Etsy. I will send an invoice to your email from PayPal which allows partial payments. Once the deposit is paid, I will put your painting on my schedule. If you have any trouble with this, please contact me and I'll be happy to help! 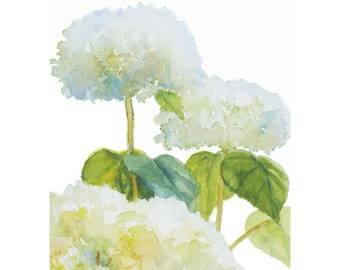 YUPO® is a synthetic paper that I have recently started using for some of my watercolor paintings. I like the spontaneous effects and brilliant color that result with this paper. I also like the fact that it is non toxic even during production. All paintings on this substrate are identified as YUPO paintings in the description. This tree-free paper is made from inorganic compounds and is 100% recyclable. It is waterproof, so it does not buckle when wet as ordinary watercolor paper will during the painting process or when displayed in humid conditions. The paper is produced without the use of toxic materials that can harm the environment. Its primary raw materials are carbon and hydrogen, so it does not emit toxic chlorine gas.